The timeframe of an event in a tarot reading is a frequently asked question, even though there are no absolutes. Methods for interpreting time are an important skill for a reader to have. One simple way to determine timeframe uses just the four Aces. The Aces represent the root force of the powers of the elements, and time sequencing refers to the quality and pace of elements. So, fire (Wands) represent days, air (Swords) represents weeks, water (Cups) represents months, and the slowest earth (Pentacles) would represent a year or more. The four Aces are also each assigned to a season – Wands (Spring), Cups (Summer), Swords (Autumn) and Pentacles (Winter). It is important to try out different methods to see what works for you. 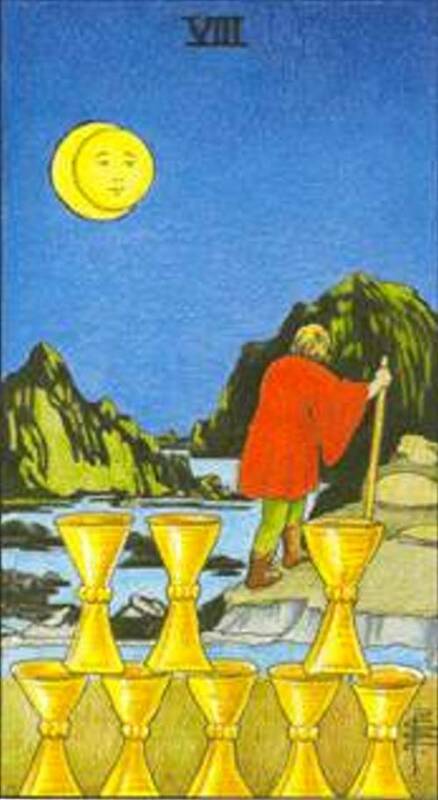 The Eight of Cups guides us to reflect on what does not serve us anymore. What can we let go of and walk away from? Often we invest a great deal of ourselves into projects, situations or people but do not see a return on investment or even a reasonable progress or some sign that things will change. It does not feel worth the effort. As a result, you may be prepared to walk away and pursue something else. Are you where you had planned to be? What action can you take to get there? Move towards your dreams and goals. Pleasing others should not be your driving force. Sometimes we get stuck in the run of the mill and forget ourselves. Be true to yourself. There’s no need for radical action. Be pragmatic in how you plan on changing course. The High Priestess is assigned the number 2. 2 symbolises duality and balance. 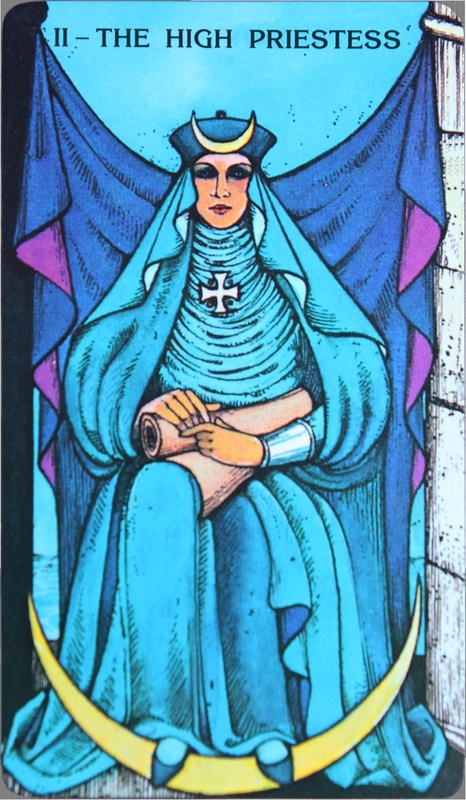 The High Priestess is mysterious and mystical. She indicates that the situation will still unravel, at a pace that she thinks you need. She is guiding you not to act or make decisions in a haste. There is hidden knowledge yet to be revealed. Hidden agendas will come to light. Be patient. This card is about secrets. Make sure that you confide in trustworthy people. If someone tells you their secret, then take it to the grave. She also encourages you to trust your instinct. Got a hunch about something? Go with your gut. She asks you to focus inward to find your truth. She will help you reveal your strengths. Tarot is a guide. You are the Master.